I want to start this segment by relating how I deal with distractions with my dogs. When my dog and I encounter a new environment or situation, I typically let him approach and sniff freely. I let the dog listen, sniff and look closely, pretty much as it wants — if of course it’s safe for him to do so. I simply stand by patiently until he’s had a chance to put this new thing into the category that he is comfortable with. I watch closely to see if the dog’s reaction is one of anxiety or curiosity. If the dog is tentative about the new thing, I may walk up to the thing myself, maybe prop my arm or foot on it to let the dog know that I don’t see it as a threat. Once I see that my dog has had a chance to acclimate, I’ll then take over and tell him it’s time to go to work. I avoid forcing the dog to approach. If the dog wants to move away temporarily, I’ll let him do that until he’s ready. 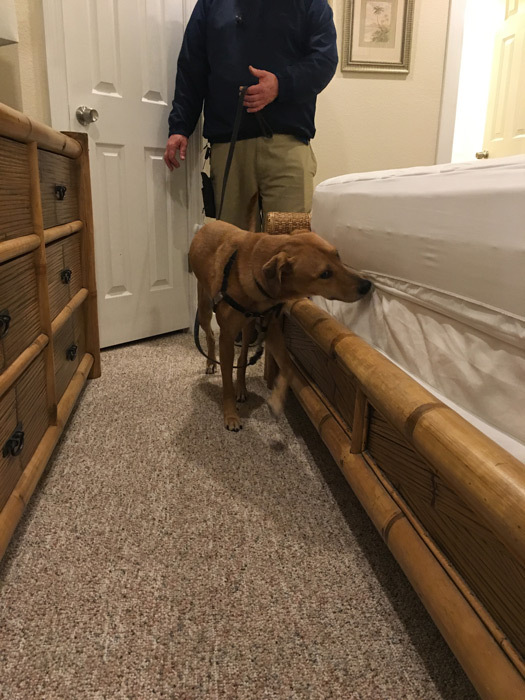 There are subtle body language signs that you can learn to recognize when the dog shifts from what it deems as a necessary investigative evaluation into curiosity or amusement mode. One such sign is that a male dog may hike his leg and urinate on the new thing. You can be fairly certain that the investigation phase is over when that happens. I’ve had female dogs that do this, too, by the way. There are other signs such as the dog turning away from the new thing, relaxing it’s body posture or opening its mouth and breathing normally. These are signs that the dog has decided that the new thing isn’t a threat or isn’t interesting enough to deserve its undivided attention. Here are a few common body language signs that a dog is fearful of something new: The head is held high and the ears are erect, one foot is possibly held off the ground. The dog may glance away as if looking for an escape route. This glance is easily discernible as different from the looking away described above in that the dog will not likely open its mouth or lower its ears and the glance will be very quick and may even appear furtive. There are many, many other body language cues that handlers should learn that are contained in Dr. Coren’s books. Becoming familiar with canine body language will make you a better and more professional handler. Next time, we’ll talk about what to do to get your dog to ignore distractions.